Electric fogging machine which takes liquid material and converts it to a mist. This mist is then directed over an air space where mosquitoes are active. The mist or fog will quickly kill flying mosquitoes, gnats and other flying pests. 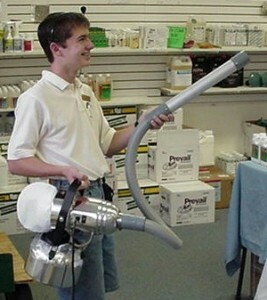 This machine is unique because it has an extension which enables the user to reach hard to get to areas. It comes with a long extension which can be directed up high, around solid objects or under covers, sheathing and decks. This machine can handle both water and oil based products and can fog up to 9-10 ounces per minute. It comes standard with a 16 inch hose shown in the picture above but is also available with a 38 inch extension.